Adult Great Skuas mostly winter in the Bay of Biscay and off Iberia, where they associate with fishing boats and feed on discarded fish. Some immature birds may mix with them, but others move farther south to winter off African coasts, with some birds crossing the Atlantic to be found off South America or in the USA (Migration Atlas). 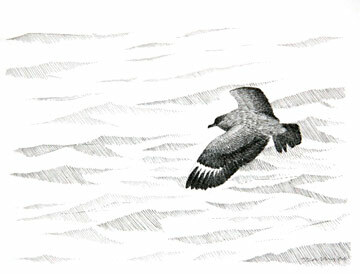 It seems that it was probably Great Skuas from the Bay of Biscay that were caught up in the remarkable gales of November/ December 2006 that brought a series of records in the last winter of this Atlas, in a similar way to those for Leach’s Petrel and Manx Shearwater. After no records in 2004/ 05 or 2005/ 06, the first Great Skuas in 2006 were noted off Hilbre on 4 December and 6 December, with two off Hoylake shore on 6 December. There was another report from Hoylake shore (SJ28E) on 9 December, the day of the largest numbers of petrels and shearwaters. It could well have been the same bird that moved farther up the Dee Estuary, and certainly one individual was reported to have been responsible for Atlas records in all three tetrads mapped there. On 10 December it was seen on the outer saltmarsh off Burton Point (SJ27S) harassing roosting waders and wildfowl, and was then seen on 11 December off Parkgate (SJ27U) exhibiting the same behaviour before flying out to roost on a sandbank in the centre of the estuary (SJ27J). A final record was added, again from Hoylake shore, on 29 December 2006. This large predator usually passes through in autumn, accompanying terns and gulls which it harasses until they disgorge their food. Winter birds are rare and the early county records are confused. The earliest documented winter record appears to have been at the end of November 1939, when a correspondent of Boyd saw one at the mouth of the Dee (Boyd 1946). Bell (1967) details the first known dated December record as a bird off Hilbre on 4 December 1961, although Craggs (1982), summarising Hilbre records for 1957-1977, shows none for the period mid-November to February. There seem to be no such queries over birds at Red Rocks on 6 December 1964 and off Ince Bank on 11 December 1966 (Bell 1967). In the 42 years from Bell’s book (1962) to the start of this winter Atlas, Great Skuas have appeared in 15 winters, with an even spread of birds in each month from November to February. Although most winters had only odd records, there were multiple sightings in four winters: in 1987/ 88, single birds were seen on four dates from 3 January to 18 February, 1992/93 had at least two different birds on seven dates from 2 January to 19 February, while 1999/ 2000 had single birds on three dates from 26 November to 27 December. By far the most remarkable was the winter of 1989/ 90 when birds were seen from Red Rocks and Hilbre on many days from 27 January into early March. Four birds were off Red Rocks on 28 January, while on 11 February six moved west and two east there. Next day ones and twos were seen at several sites along the north Wirral coast between New Brighton and Hilbre while one was up the Dee Estuary off Burton. The majority of all winter sightings are from the north Wirral coast but birds have been seen in four winters in the Dee Estuary as far as Inner Marsh Farm and the Mersey Estuary to Ince Marshes. Thus, although the gales of December 2006 were extraordinary in their effect on some seabirds, this winter Atlas map for Great Skua was typical of any recent three year period.